Race against your friends to the finish line. The Jungle Extreme Obstacle Course is one of the longest around. It can be set-up a variety of ways including end to end making a 135 ft. long race for 2 kids at a time, side by side and in an "L" shape. Recommended for kids 42" and taller, this unit has been used at elementary schools, backyard events and universities for the college kids. You can rent one, two or all three sections. 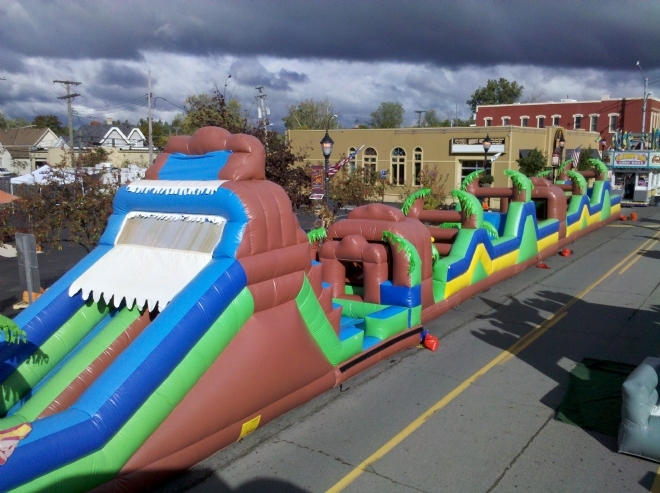 Cost of Inflatable Obstacle Course Rental includes delivery and set up to Milford, South Lyon, New Hudson, Novi, Northville, Highland, Wixom, Walled Lake and Salem.